This is another time where you will have to decide whether you want to save some time by buying a ready made wiring harness or save some money by making up your own. I was fortunate that my power-train came with the ECM module and most of the engine bay wiring harness including all the connectors for the sensors so I hooked everything up myself. To do your own wiring, first of all you want to see if there are any wiring tables that reference how to integrate your power-train wiring into the Fiero loom. GM Tuners has a bunch of tables here, I found the one for my 1997 Grand Prix GTP PCM there, printed it out and used it as a checklist to ensure that everything necessary got connected. If there is nothing there for your application, but you can find the wiring diagram for your powertrain and the pin-out for your PCM (if applicable), maybe you can work out how to wire it up using the available tables as examples. Next you need to decide where you are going to mount the PCM. I decided to modify my centre console and put my new PCM in the same location as the stock one. Unfortunately, this meant that I lost the handy little storage tray so that the door would close; there is still room to store some stuff in there but it just sits agains the PCM and you can see some of the wires. Since my power-train uses OBDII, I was able to leave the connector in this storage area along with a couple of inline fuses for easy access. To wire the new power train into the Fiero wiring harness, you will also need to connect to the Fiero’s C203 and C500 connectors. The pinouts for these connectors is here and you can find the actual C203 connector just below the PCM in picture PCM Location 1 above, and the C500 connector is next to the battery, near the fusible link on the passenger side of the engine bay – at least that’s where they were on my car. Once you have your plan of attack, it’s time to start hooking things up. Let’s say your table says that pin 6 on you PCM is a yellow wire for the vehicle speed sensor (VSS) high input and it needs to be connected to pin B of your VSS connector. You need to identify the VSS connector on your power train, run some (preferably yellow) wire from the sensor to pin 6 on your PCM. Obviously you need to route the wire carefully, avoiding hot or rotating components and I left a bit (too much) of extra wire in case I needed to move something later. As it happened I ended up moving the Ignition Control Module/coil pack and the fuel pump relay but I have about a foot of extra wire on EACH connection just getting in the way and adding weight – I guess that is better than being a foot short on each one! I made nearly all my connections by stripping about 3/8″ of the casing off each end and tinning them (applying a layer of solder ready for joining). Then threading some shrink tube over one end, joining the tinned ends by simply aligning them side by side and soldering, before sliding the shrink tube over the join and using a heat gun to seal up the join. Afterwards I found out that this is not the optimum method and even though everything still seems to be working fine, the joins aren’t as strong as they could be. This page shows a process of splicing wires and has a link to the very detailed NASA Standard. If I had known about that at the time, I would have certainly used this approach or something very similar; I’m not going back and re-doing all my connections now though! 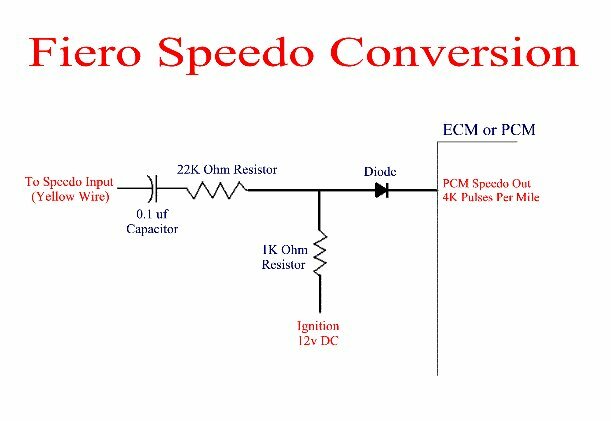 For some reason (that I don’t fully understand) the speedo signal coming out from the 3800 PCM will not directly drive the stock Fiero speedo. Fortunately you can make a simple circuit consisting of a couple of resisters and a capacitor to rectify this. Further details can be seen here. My Fiero was the 2M4 version with the old Iron Duke 4 cylinder engine so my tachometer didn’t show the correct engine revolutions with the new V6 and didn’t have an oil pressure gauge, just a switch with a light. Fortunately, my buddy kept the tachometer from his V6 Fiero that has a built in oil pressure gauge and better still, the V6 tachometer plugs straight in to the dashboard clock pod and all the wiring for the oil pressure gauge is already there. You will need to get hold of a 3 pin oil pressure sender unit for a 1988 Fiero (they had one in stock at my local parts store) and install that in place of the stock L67 unit. Then simply connect the tan wire from the center pin of the new oil pressure sending unit to pin E of the Fiero’s C203 connector. The oil pressure sending unit’s output to the gauge (the tan wire you just hooked up) grounds through the threads of the sending unit itself, so do not use teflon tape to seal the threads when installing the sending unit. Initially, I bought a used Walbro 255L fuel pump that frequently failed after about 30 minutes of driving, usually in hot weather. In the end, I replaced the Walbro pump with an AC Delco EP381 pump (that fits a 1993 Chevrolet Astro van among other things). The AC Delco pump is a direct replacement for the stock Fiero pump and can handle taking the L67 power-train up to about 300HP. The local parts store didn’t have the AC Delco pump in stock so I ended up with a Delphi FE0114 equivalent pump that was about $130 and has been running problem free for several months now, including some hot days. While I was troubleshooting the pump, I decided that I would follow the recommendations to hot-wire the fuel pump and eliminate any dodgy connectors or under-rated wiring. The stock Fiero wiring is a bit confusing because it has a wire from the oil pressure sensor that at first looked as though it would shut off the fuel if oil pressure was lost but instead, it just provides a second live feed to the relay while there is oil pressure – for some reason?? I decided to stick with the basic hot-wire circuit and delete this addition feed. Using 12 gauge wire, I connected a direct power feed from the alternator to the relay and then returned the output from the relay straight back to the fuel pump through a 20A in-line fuse. Now, only the output from the PCM (a dark green and white wire from pin 8 in my case) controls the fuel pump relay through a 14 gauge line (16 gauge would have been better here I think). I also spliced into the ground wire that goes to the fuel tank and added another ground connection to the chassis because this also serves the fuel pump apparently. If you delete any equipment/sensors from your power-train such as the second O2 sensor in the exhaust, the Exhaust Gas Return solenoid or the Evaporator cannister you are likely to end up with the Check Engine Light coming on. Your engine might also have an anti-theft feature that interrogates the key and cuts the engine if it doesn’t recognize it. In these cases you can send your PCM off for re-programming to remove the checks for the missing systems. There are some places online that offer exchange programs where you send them your PCM and they ship you a unit modified to your specifications. You can also take the opportunity to modify some other parameters such as transmission shift points. You should also ensure that any modifications you make do not violate any emissions laws in your area. If you’re lucky and so inclined, it might be that you can simply hook up the equipment you have and then live with the CEL on all the time and routinely check the codes to see whether there are any new ones.